The Wisdom of the Many is brilliant, the aggregated wisdom of all of us, with each of us acting in our own self-interests is wiser than the wisest of us at choosing between choices. Race based slavery and the Civil War. The annihiation of the American Indians. The Internment of Japanese Americans. The mortgaging of children, voters giving ourselves $21 trillion more in Federal benefits than we contributed in taxes. Resource depletion with US Peak Oil in 1970 and Climate Change. The Constitution was designed by Madison and improved by the Great Compromise in the Constitutional Convention, to make diversity the defense against Tyranny of the Majority. 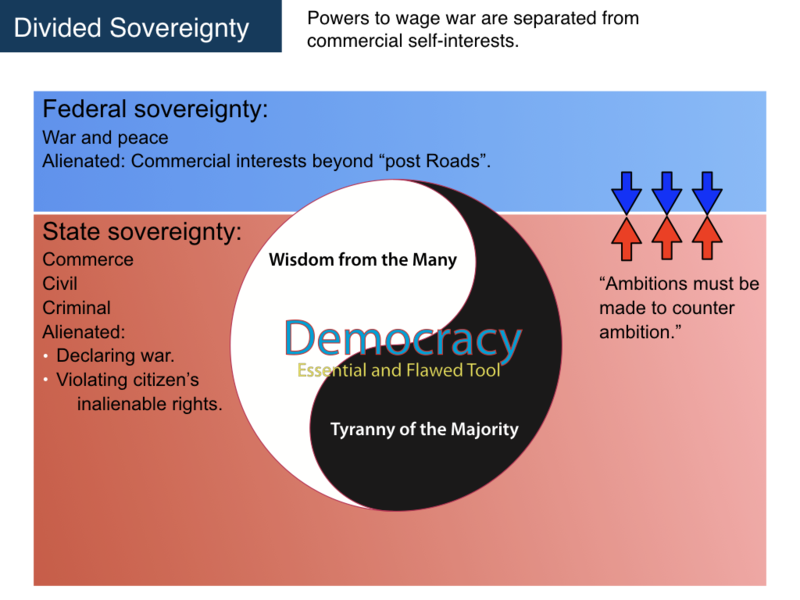 The Constitution divided sovereignty between two types of governments to monopolize two types of violence. The Federal government is sovereign over issues of war and coerce actions that build paths to war. The State govenments are sovereign over crimes and commerce. After dividing sovereignty, the Constitution divided the war-powers of the Federal government into three branches. The Constitution divided election processes into three types, popular election by the people in the House, state legislators electing Senators, and the Electoral College aggregating popular election of the President. This diversity defense of liberty through Divded Sovereignty and diversity of interests is explained in Federalist #9, #10, and #51. It is furthure explained by Madison in the Virginia ratifying convention. The 20th Century saw the end of diversity and the winner-take-all politics increase. Seeking more power a Tyranny of the Majority formed in the early 1900s to expand the police powers of the Federal government. The desire for more conformity and less liberty is illustrated by the 18th Amendment that applied Federal war-powers to making selling a beer a Federal crime. The majority wanted more and more. With the 17th Amendment, shifting election for Senators state legislatures to popular election, the power of national minorities that were a majority in a state was reduced. The cost of political corruption was reduced from buying half a state legislature to merely contributing to a Senate campaign. Unions and corporations funding elections influenced the majority to vote for Senators that would tax and build infrastructure that would sell their products. A majority of voters wanted Federal highways and subsidized cars and house loans. Federal politicians voted to violate the Divided Sovereignty of the Constitution, to mix war-powers with their commercial self-interests. Foreign oil addiction and the mortgaging of children to fund $21 trillion more in benefits than contributions was voted into place. 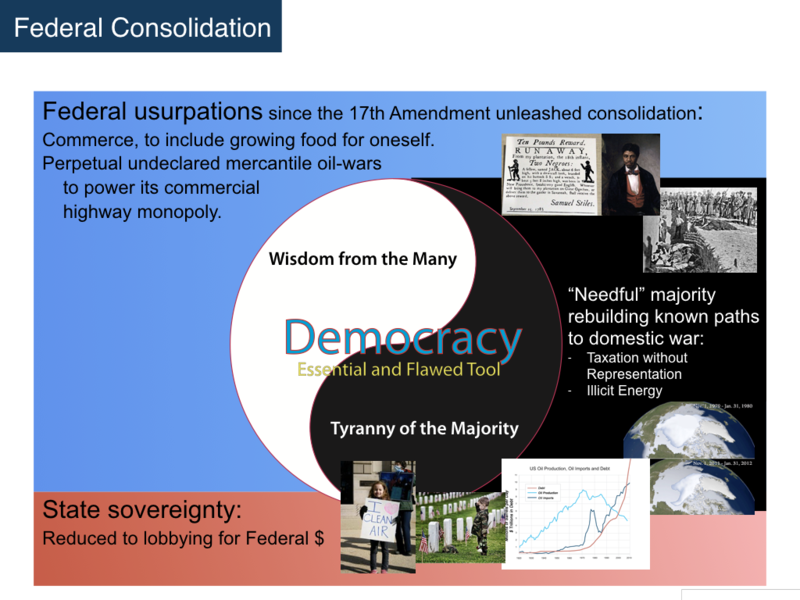 Without the State government electing Senators to represent the economy of their states, Federal consolidation pushed aside Divided Sovereignty with states becoming sublicants, lobbying the Federal government for money. The brilliant aspect of democracy is Wisdom from the Many. The book, The Wisdom of Crowds, provides many examples of how the aggreated wisdom of all of us, with each of us acting in our own self-interest, is wiser than the wisest of us at choosing between choices. The vile aspect of democracy is Tyranny of the Majorty. In America, this characteristic accounts for slavery, annhilation of the American Indians, Jim Crow Laws, and mortgaging the liberty and labor of every child in America to $59,734 (July 16, 2016) in Federal debt without consent. How the Constitutiion was written to use Wisdom from the Many while limiting Tyranny of the Majority. How the 17th Amendment unleashed Federal consolidation of power and Tyranny of the Majority. Civilization Killers created by violating the Constitution. How the Constitution can be used to mitigate these Civilization Killers. In a State of Nature, violence is unlimited. We create governments to monopolize violence to coerce compliance with law. We limit governments to limit coercion. 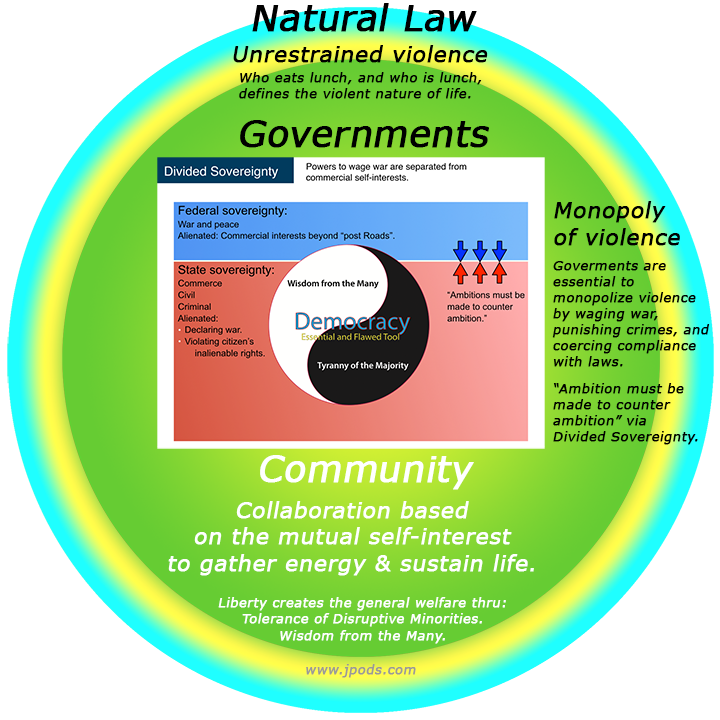 With the US Constitution we divided sovereignty of two monopolies of violence between two types of governments. To the Federal government we granted unlimited taxing powers to wage war and coerce behaviors that build paths to war. We allienated Federal involvement in commerce beyond delivering letters in defense of free speech, the "post Roads" restriction. To state government we allienated waging war and granted a monopoly of violence to coerce compliance with criminal and civil law. For all else, the people retain liberty to create the general welfare.